"I wish we'd never forgotten what we were to each other." John Gallagher's Blue Moon is a success at the basic level of the word. It is a film that sets out to convey a very simple message, which it does and perhaps a bit more. Audiences have seen the tired old romantic genre done over and over again, but Blue Moon offers something more by avoiding the usual boy-meets-girl story. Instead, the audience is offered an exploration of two separate couples' hardships at different periods in their relationships. On one side we have Frank and Maggie, the dispassionate older couple who view their marriage as a thing of the past. On the other side we have the young couple, Mac and Peggy, who approach their future with trepidation and fear.The film opens at a party following the christening of Frank and Maggie's grandchild. Frank is obviously depressed after retiring, and it is apparent that he and his wife are experiencing a great strain within their marriage of forty years. Maggie's urging Frank to watch his drinking over the course of the night are about the only words spoken between the two of them. She implies her pleas are simply because of the doctor's warning about Frank's blood sugar, but her requests seem to have some deeper meaning. Seeing the obvious tension and sorrow in their parent's relationship, the couple's three children encourage their parents to take a getaway vacation to their old cottage in the Catskills, to rekindle some of their lost love for one another. Reluctantly, they agree.After the introduction of Maggie and Frank, the story leads us to Mac and Peggy. At first glance, Mac is clearly terrified about making any kind of long-term commitment to his beautiful girlfriend. Peggy is angered with his apathy towards the importance of covenant, and after a brief argument, Mac pledges to make it up to her by taking her away for the weekend to�coincidentally�a cottage in the Catskills. Tempers fly for both parties on the way to the mountains; one argument causes Frank to almost drive him and Maggie off the road in a fit of anger. Peggy and Mac are also at wits end with one another on their drive, further illustrating the nature in which these two couples' lives exist on a parallel plain. While Maggie and Frank are frustrated with where they are, Mac and Peggy are frustrated about where they are going in their relationship. The two couples finally meet in a cute and almost slapstick kind of way, due to a cabin mix-up. At first this setup seems rather long for what is finally discovered, but in retrospect, it is necessary to invoke the proper emotional investment in these characters when the essence of the story is unfurled. After their borderline violent introduction, these four begin to realize that they are connected in more ways than meets the eye. As they begin to explore their lives, their history is presented in a series of often humorous, at times touching, and occasionally dramatic flashbacks. This is where the very core of the film is revealed, focusing on the rekindling of lost love in an older couple's relationship, and a young couple's discovery of how relationships can triumph in even the most adverse situations.Filmed on a modestly low budget, some of Blue Moon plays like an ABC After School Special, or at its worst, an episode of Days of Our Lives. With terrific performances by Ben Gazzara and Rita Moreno, the film is, at times, marred by Brian Vincent and Alanna Ubach's tendency to over-emphasize their emotions. With these relatively minor distractions in mind, I could not help thinking to myself how well this screenplay would work as a stage play, or at least much better as a made-for-TV movie. However, there is an underlying sweetness beneath it all and a poignant message, even if a little basic. It is this simple charm that might prevent skeptical viewers from turning their backs on the film, and those who initially want to lambaste it for its syrupy cuteness just might find that they end up connecting with its touching nature. I am not generally a sucker for the usual romantic fare, yet I enjoyed the sentiment, heartfelt nature, and eloquent message of Blue Moon. It has a simple story to tell and accomplishes such in an effective and charismatic way. It is a recommended date movie and entertainingly insightful for couples both young and old. Image Transfer Review: It's truly unfortunate that the theatrical 1.85:1 aspect ratio was not used here, but I will say that, except feeling a little claustrophobic in several scenes, the 1.33:1 full-frame transfer is very pleasing to the eye. It does not look like the original print has been cleaned up very much for the DVD production, but being a recent release, the film elements have been preserved very well, providing a viewing experience free from glaring distractions. There are the usual nicks and scrapes present, but they are considerably minor. Colors are often vibrant and bold, yet at times there appears to be an overall orange tone marring the picture. Black level is not as thick and deep as I would like, but it is solid and never looks washed out or gray. Aside from these minor distractions, the print is first rate, despite the lack of a 1.85:1 aspect ratio. Audio Transfer Review: Rather than 2.0 Dolby Surround, the soundtrack is a less dynamic 2.0 Stereo Surround. The soundtrack appears mostly mono in nature, and with surround decoding on, properly remains in the center channel. Overall, everything is rather quiescent and this may require the listener to pump up the volume a few notches in order to find a comfortable listening level. Dialogue often sounds ADR-produced, but fidelity is first rate and the voices are always clean and clear. The predominately mono mix is the right choice for a film of this nature, and any more creative use of a multi-channel soundtrack would have probably sounded artificial and unnecessary. Extras Review: As expected with a relatively obscure film, nothing much is offered in the way of special features. The one noteworthy supplement is the film's theatrical trailer, presented in 1.85:1 nonanamorphic widescreen. This could very well be the DVD's most disturbing characteristic. If the trailer is presented in widescreen, why isn't the main feature? Even a nonanamorphic transfer would have been better than the 1.33:1 full-frame version we are given.Also included are Filmographies for the four main actors and writer-director John Gallagher, DVD production credits, and a weblink. 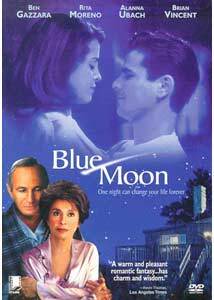 Blue Moon cannot necessarily be considered couples therapy, yet it is highly recommended viewing for anyone in a serious relationship. Just go into it with modest expectations and an open mind, and allow the story to entertain on its most basic level. It is a shame that this film did not connect with more audiences during its theatrical release, so here is a second chance to experience this heartfelt romance.